In this tutorial, we’ll be focusing on how to get our Chat iPhone App Template up and running. The Swift template is working end-to-end, being integrated with Firebase Backend, where all the user & message data is being stored. 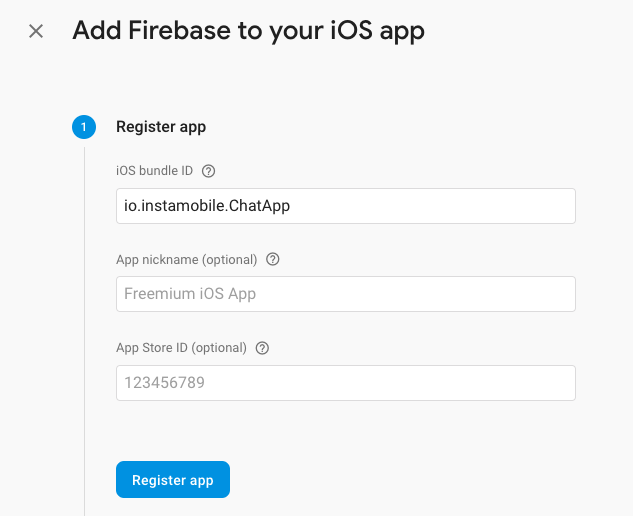 In order to have your own instance of the real-time chat app, you’ll need to wire up the purchased app template to your own free Firebase account. Run the app in the latest version of Xcode. This document will also describe how to make your own real-time iOS Chat app in Swift, by leveraging our pre-made app template. Assuming you’ve already downloaded the Chat template, let’s get started! First of all, you need to configure your backend. This is the server where all the users, groups, & messages are being stored. Firebase is a service provided by Google, which helps app makers with their server-side implementation. It has amazing features, such as database, authentication, storage, notifications, analytics, etc. And best of all, it’s completely free! 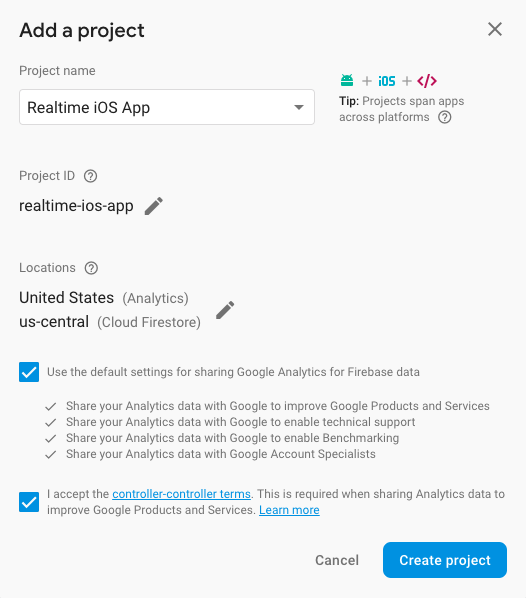 Go to Firebase, log into your Google account and create a new project. If you already have a Firebase project for your chat app, you can skip this step. 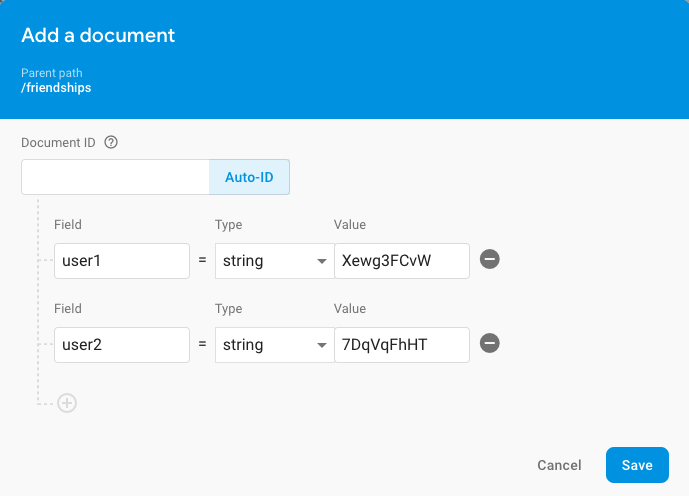 Since our app template comes with both Email & Password login and Facebook Login, you’ll need to enable these in Firebase, in order to accept user logins and registrations. To do that, locate the Authentication tab in the left side menu -> Sign-in Methods -> Enable Email/Password and Facebook. 2. Locate the existing GoogleService-Info.plist file in the downloaded Swift source-code (it’s in ChatApp/ChatApp/GoogleService-Info.plist) and replace it with the one you’ve just got from Firebase. Now that you’ve configured your Firebase backend, and you hooked it up to the app template, it’s time to see the real-time chat app in action. If you don’t have Cocoapods installed, check out their website to get started. Choose which simulator you want to run (or plug in your iPhone device) and click “Run“. This will install the Chat app on the chosen device. Play around with the app, by creating an account (email/password or Facebook Login). You’ll notice the newly created account in Firebase -> Authentication. You’re also supposed to see the “users” table now (in Database -> Firestore), containing the newly created user info. The home screen will be empty though, and you won’t be able to search for any friends) – this is expected since there are no friendships so far. You’ll need more users, in order to have a proper Chat app, so go ahead and create more accounts, via the iOS app. You can also create them manually, in Firebase -> Authentication -> Add User. – “channel_participation” – mapping users to channels (“User X is participating in the conversation channel Y”). While “users“, “channels” and “channels_participations” are automatically created and populated by the iOS Chat App, in order to be able to search for a friend, you need to create that friend relationship manually. Add two new documents to the “friendships” collection. In order to make two users friends, you need to add two new entries to the friendships table, matching their user IDs. Go to Database -> Firestore -> “friendships” and click “Add Document“. Use an auto-ID and add two fields: user1 and user2, and enter the two user IDs located at the previous step as the values. Then click “Save“. Do this again, by making sure you switch the order of these two users (user1 becomes user2 and vice-versa). This is to ensure both users are friends with each other since the friend relationship is not bidirectional. Make sure you log in with a user for whom you’ve already added friendships in the database. Now, the app will list all the friends on the home screen, and you’ll be able to search for users on the search screen. You’ll also be able to create chat channels, chat groups and send messages & photos between friends. We hope this tutorial has been helpful in teaching you how to make a real-time chat iOS app in Swift by leveraging our premium app template. Please let us know if you encounter any issues or if there’s anything missing. How do I integrate a Chat into my existing iOS app? As you can see, you need to specify the user who opens the chat room, the channel that is being opened (can be a 1-1 conversation, a group chat, etc – all it matters is its ID), as well as the UI colors you prefer for your chat.